This is one of the nicest color changing fans that I have come across. It has a nice woodgrain covering on the exposed "handle" and the fan blades have bright, vibrant colors -- (better than they look in my not-so-well-lit photo). Plus the fan is BIG. It is 10 inches long when closed, and when swung open, it is 18 inches acros and about 9 inches from the pivot point to the top of the fan arc. 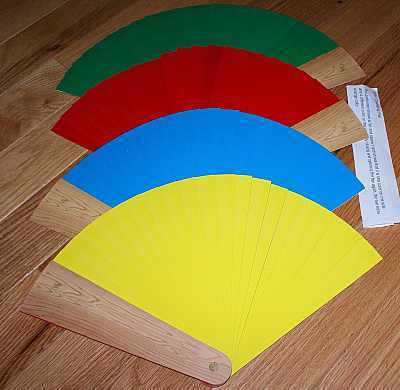 NOTE: Photo shows FOUR fans, opened to each color. You get ONE fan in this eBay lot, that can open to all four colors as you choose.